Fennel, with its tantalizing anise flavor, is the basis for this smooth, elegant vegetable puree. So intrigued was Henry Wotten, England’s ambassador to Venice in the 17th century, that he sent seeds to King Jame’s gardener, with the instructions on how they should be planted and the vegetable prepared. 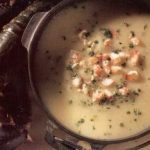 This soup is given a luxurious touch with the addition of lobster. “In Venice we would probably use scampi, but those are very difficult to find in America,” Francesco says. “Besides, the lobsters here are wonderful, so this adaptation makes sense.” At Remi, Francesco might replace the lobster with a dollop of creme fraiche topped with good sturgeon caviar, a special occasion touch that would not be out of place for a gala dinner at home. Heat the oil in a heavy 4-quart (4-L) saucepan. Add the onion and fennel and cook slowly until they are transparent. Stir in the celery root. Add the stock, bring to a simmer, and add the potatoes and cumin. Simmer, partly covered, for 45 minutes, until the vegetables are very tender. While the vegetables are simmering, steam the lobster for 15 minutes. Allow it to cool slightly, then remove the claw meat and tail meat from the shells. Dice the lobster meat and set aside. When the vegetables are tender, allow the soup to cool briefly, then puree it in a blender or food processor. You will have to do this in batches. Return the soup to the saucepan, add the Pernod, and season with salt. Reheat the soup and stir in half the tarragon. 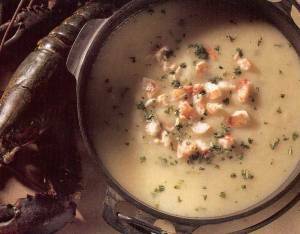 To serve, spoon the soup into flat soup plates and spoon some of the lobster in the middle of each. Sprinkle with the remaining tarragon.